Jack Brabham was an uncompromising and determined character whose knowledge of mechanics helped him go on to found his own team and become the only man to win a world title in a car bearing his own name. 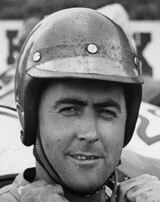 Brabham started racing from an early age, learning his skills on dirt tracks, becoming New South Wales champion at the first time of asking and forging an early alliance with Ron Tauranac, with whom he would later form Brabham. He clashed with the authorities over his insistence his Cooper would carry sponsorship, so headed to New Zealand where he won the national grand prix in 1954. Buoyed by that success, he headed to Europe where he made his Formula One world championship debut in 1955 driving a Cooper. No sooner had he arrived that he became indispensible to Cooper as both a driver and an engineer. In 1959 Brabham won the season opener in Monaco, and added a second victory at the British Grand Prix, but it was his consistency which enabled him to keep picking up points. He secured the title in memorable style, pushing his Cooper over the line in the US Grand Prix after his car ran out of fuel. In 1960 he showed it was no fluke by retaining the championship, doing so in a far more dominant way by reeling off five successive wins and wrapping up the title with two races to spare. The new regulations in 1961 left Brabham a bystander and he failed to gain one podium finish, but his thoughts were elsewhere and in 1962 his own Brabham marquee made its debut. His fourth place at Watkins Glen at the end of the season was the first for a driver over a car manufactured by himself. Dan Gurney joined Brabham and while there were some non-championship wins, it was not until Gurney's victory at the 1964 French Grand Prix the team gained its first success. In 1965 it seemed Brabham, by then almost 40, was winding down his career but in 1966 he stormed back, winning in his own car for the first time, again in France, and going on to clinch a remarkable third title. In 1967 team-mate Denny Hulme pipped him to the championship, but as team boss he was finding frustration as his drivers were poached by bigger teams - in the late 60s he lost Jochen Rindt and Jacky Ickx. He had intended to quit after 1969 but Rindt's decision to join Lotus forced him to keep going although he sold his shares in the Brabham company to Tauranac. In 1970, what was to be his final season, he won the first race at Kyalami and again may well have pushed eventual champion Rindt hard had Brabham not twice lost races he was leading into the final corner, both times to Rindt. He retired to Australia after where he bought a farm and maintained various business interests, which included the Engine Developments racing engine manufacturer and several garages.